an organization will finance their remaining education. 1.Download deposit slip from www.awts.org.pk. 2.8ubmit it to any branch of the designated bank. 3. 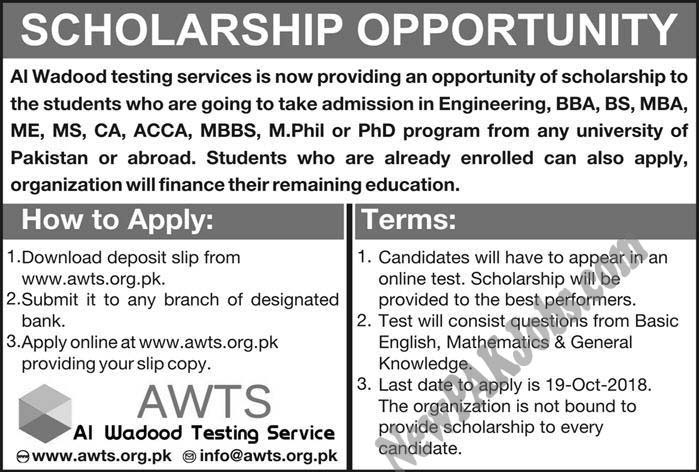 Apply online at www.awts.org.pk providing your slip copy. 1. Candidates will have to appear in an online test. The scholarship will be provided to the best performers. 2. The test will consist of questions from Basic English, Mathematics & General Knowledge. It is requested to you dont be a part of this scholarship as they are doing only their business nothing else.After getting a huge amount from students they just give 20% to 30% of this money to students in order to show it a scholarship.